Today's London Times is reporting that the London School of Economics is investigating the award of a doctorate to Saif al-Islam Qadafi, son of the beleaguered Libyan dictator. This blogger has his own twist to add to the story. Shortly after Mr Qadafi started his studies at the LSE it became clear that he was struggling, not least with economics. The then Libyan ambassador to the UK discreetly requested that Saif be given extra tuition, and by various circuitous routes I was approached to tutor him. For several months I trolled into London from Buckinghamshire in the early evenings to give private tuition at his town house on Cadogan Place, Knightsbridge. But I faced an uphill battle. Saif was not, how to say this politely, the brightest of students. Not only was he totally uninterested in economics, he lacked the intellectual depth to study at that level, and showed no willingness to read let alone do course work. Worse, our tutorials were endlessly interrupted, either by the constant comings and goings of his retainers, or by his mobile phone, which rang every two or three minutes. Saif was living proof that the sneer of cold command and the mocking hand are timeless qualities. While I was astonished, years later, to hear that Mr Qadafi had been awarded his doctorate by the LSE, I was not at all surprised to hear on the BBC this morning that concerns have been raised about plagiarism. Corruption comes in many forms, and the fact that the LSE accepted a significant financial bequest from the Qadafi family just doesn't smell right. They know what to do. POSTSCRIPT: Since posting this blog my attention has been drawn to this article by the LSE's Tony Giddens. What can one say? The final paragraph was ill-judged back in 2007, and with the benefit of time we can see how the author deluded himself about Qadafi, or worse, was prepared to use his reputation to pave the way for rapprochement between Britain (with its voracious appetite for cheap oil and gas) and the Libyan regime. Activists across the US ­frustrated with state and federal budget cuts ­took to the streets on Saturday Feb 26th to protest corporate tax dodging. Protests in over 50 cities focused on Bank of America, which paid no taxes in 2009 or 2010, according to their SEC 10-K report filed on Friday. Local activists protested inside and outside of Bank of America branches, conducting teach-ins about corporate tax avoidance and theatrical "bail-ins." Protests in Washington, D.C. and San Francisco forced the early closure of major bank branches. The U.S. effort ­called US UNCUT ­has been inspired by a movement in England, called UK UNCUT. English activists have targeted corporations that have paid no or very low corporate income taxes, largely thanks to elaborate use of overseas tax havens and other tax loopholes. As in England and across the Middle East, the decentralized protest movement is organized largely through the web site, and Facebook, Twitter and meet-up technologies. The U.S. movement was started two weeks ago when 23-year old Carl Gibson, from Jackson Mississippi, became fed up with state budget cuts. While working 3 part-time jobs, Gibson organized a web site and a local Mississippi UNCUT group. He was galvanized into action by the activities of UK activists. "There's a direct connection between corporate tax dodging and what's happening to real people¹s lives," said Gibson. "Because of overseas tax havens and other tax loopholes, US corporations are making profits in America but barely paying taxes here. If we close those loopholes, we wouldn't have to be cutting back on firefighters, library hours and student loans." These protests are putting a spotlight on the shadowy world of overseas corporate tax havens. Irresponsible U.S. corporations shift their earnings around ­ reporting losses in the U.S. while reporting profits in tax havens like the Cayman Islands, where they pay little or no taxes. U.S.
congressional budget officials estimated that over $100 billion a year is lost because of such tax loopholes, enough to eliminate all state budget deficits combined. Nicholas Shaxson, author of the new book Treasure Islands , writes that tax havens are a major mechanism through which "wealthy and powerful elites take the benefits from society without paying for them." "Why has the knee-jerk reaction for our politicians been first and foremost budget cuts to critical social services? They tell us that no other options are on the table, yet cracking down on corporate tax avoidance has received little, if any attention," said George Taghi, an organizer for the DC Uncut action. Protests against corporate tax dodging could be one of the ways that the spark of Wisconsin could spread widely. While not every state has a reckless anti-union governor like Scott Walker or the union solidarity to push back ­every state is facing huge budget cuts. According to the Center on Budget and Policy Priorities, the combined budget gaps in U.S. states is at least $102 billion ­and probably closer to $148 billion. This is just the beginning. USUNCUT is identifying the next wave of targets for actions that include corporations with high profiles and retail outlets. A coalition of domestic businesses has spoken out against tax havens. Small and U.S.-rooted businesses are hurt by tax havens because they are forced to compete on an unlevel playing field. Business and Investors Against Tax Haven Abuse , launched last summer, is organizing business voices and has a national petition. The Tax Justice Network USA is looking forward to hosting author Nicholas Shaxson for the US release of his new book, Treasure Islands: Tax Havens and the Men Who Stole the World ­which will come out during the US April 15 "Tax week." Feb 27 - Celebrating the success of its first worldwide weekend of protests, the Uncut movement has promised more to come. "The banks' tax avoidance, reckless banking, and unjust cuts have become "international problems that need international action by ordinary people". See our blog Simple arithmetic. See further reporting in The Guardian. Feb 23 - Guernsey has signed a bilateral Tax Information Exchange Agreement (TIEA) with South Africa taking the total number of TIEAs signed by the Island to 22. While positive news, we maintain that TIEA's are fig-leafism, see On exchange of information for tax purposes. See also: After winning tanker contract, Boeing questioned on tax bill The Hill Feb 26 and Boeing Pays NO TAXES - But Snags $35 Billion in Taxpayer Dollars Daily Kos Feb 25. Hat tip Scott Klinger. Feb 27 - BP " has 67 offshore subsidiaries, which the company claims are based around its operations. These include a number in tax havens such as Luxembourg, a country not known for oil gushers." See also BP claim threatens to reignite corporate tax row The Guardian Feb 27 and Richard Murphy's comments on Tax Research UK. Feb 28 - Mineral trading giant Glencore is this week laying the ground for a potential long-awaited float on the London stock market which could value the company at £37.5bn. Glencore was founded by Marc Rich, indicted for tax fraud. Tony Hayward, the former BP chief executive who quit over the Gulf of Mexico oil spill, is tipped to serve as senior independent director. See Publicly funded Swiss company is dodging taxes in Zambia Feb 15 and BP rig was offshore in more ways than one May 15, 2010. Feb 27 - "A US tax evasion investigation that has prompted charges against several Swiss bankers has expanded to include Israeli and Asian banks, according to lawyers close to the probe." But we ask the question, what does the U.S. imagine its private bankers from Citi and other U.S. based banks are doing for tax dodgers in other countries? And look at the plethora of private banking operations in the money center of Miami, gateway to Latin America. Read the exposure in Treasure Islands. Feb 28 - Along with facilitating tax evasion and money laundering, the use of tax havens for legal tax avoidance is contributing to poverty in much of Latin America. Hat tip Offshore Watch. See also Latin America and the black hole of tax havens BBC Mundo (linked on Feb 12). Part 3: How can Egypt track stolen assets? Theodore Greenberg, former chief of the money laundering section of the US Department of Justice, observes how " ...money is often laundered through a web of legal entities and structures. It's like untying the Gordian knot. And the more you attempt to untangle one end, the more someone else is knotting up the other." Feb 28 - And again we ask - why only do this now?, Why are the assets only "expected to be seized within days"? A British government source is quoted as saying: "This is definitely on the radar at the highest levels." See Hypocrisy and High Corruption Feb 14. Feb 25 - The Cayman Islands three-year spending plan that states government will have zero “borrowing needs” in each of its next two budget years was forced upon it by the United Kingdom, according to Premier McKeeva Bush. See earlier TJN blog Cayman model not sustainable: former regulator Mar 20, 2010. Feb 25 - The former UK Treasury spokesman who resigned after criticising the government's handling of banking bonuses has called for companies to be forced to disclose how much UK corporation tax they pay. As Martin Hearson of our friends at ActionAid, in a letter to The Guardian Feb 28 says, "Matthew Oakeshott's proposal to make multinational companies disclose the corporation tax they pay in the UK is right on the money. ... But why stop at UK tax? British companies dodge taxes overseas too, costing developing countries billions." Feb 28 - Italian PM no longer immune from prosecution. Global Witness has learned that Teodorin Obiang, the notorious son of Equatorial Guinea's long-ruling dictator, commissioned plans to build a superyacht worth $380 million - almost three times more than his energy-rich country spends annually on health and education programs combined . This news comes amid an increasingly heated debate about how Middle Eastern dictators and their family members have enjoyed luxury lifestyles, as well as stashing their assets in foreign countries. Teodorin (full name Teodoro Nguema Obiang Mangue) asked Germany's Kusch Yachts to draw up a basic design for the secret project, which is codenamed "Zen." Last year, Global Witness revealed details from a U.S. Justice Department investigation into Teodorin which mentioned plans to build a yacht. After discovering that it was to be built at Kusch's shipyard in northern Germany, a Global Witness investigator visited the company and obtained key details about the project, confirming the identity of the client, and the yacht's price tag. The vessel's basic design was completed by Kusch in December 2009 for £250,000 ($342,000) with an original delivery date set for late 2012. However, construction has not yet started. The Obiang regime has a long track record of looting money that belongs in Equatorial Guinea's treasury. Global Witness has previously revealed Teodorin's profligate lifestyle in the US and elsewhere with a $35 million dollar Malibu mansion, a fleet of luxury cars and a private jet, while earning a ministerial salary of $6,799 per month . It would take him some 4,600 years to pay for Project Zen on his reported official salary. "Evidence points to corruption by Teodorin on a scale that would not be possible or attractive if countries like Germany and the U.S. were not safe havens, in terms of free passage for him and for his questionable private wealth," said Gavin Hayman, Director of Campaigns at Global Witness. "$380m is a staggering sum - that a President's son from such a poor country has ordered this yacht is outrageous extravagance on his part." Teodorin's father, Teodoro Obiang Nguema Mbasogo, took power in 1979 following a bloody coup and presides over a repressive government almost entirely dependent on energy revenues generated by ExxonMobil, Marathon and other multinational giants and has one of the worst human rights reputations in the world . Obiang came eighth on a 2006 list by Forbes of the world's richest leaders with a fortune estimated at $600 million, whilst the majority of Equatorial Guinea's people live in poverty . Incredibly, since oil was discovered in the mid-1990s, poverty levels have actually worsened. Equatorial Guinea enjoys a per capita income of about $37,900, one of the highest in the world. Yet 77 percent of the population falls below the poverty line, 35 percent die before the age of 40, and 58 percent lack access to safe water . Forty-one-year old Teodorin is the Minister of Agriculture and Forestry and vice president of the ruling party, and is apparently being groomed to succeed his father. A US embassy cable from March 2009 posted by Wikileaks describes how Teodorin was given a significant tract of pristine jungle to log, leaving him with a "large windfall". The author of the cable paints a picture of a nepotistic state where choice natural resource concessions are handed out to the President's family and close associates. Responding to corruption allegations, Teodorin told the US official: "I've been very lucky in business -- and I like to live well" . According to the Justice Department investigation Teodorin funneled roughly $75 million into the United States between 2005 and 2007 through three European banks -- Banque de France, Natixis and Fortis -- and then on to the U.S. through Wachovia (later bought by Wells Fargo), Union Bank of California, and Bank of America . Global Witness questioned what checks these banks had done on Teodorin's funds; they could not comment on this. "[I]t is suspected that a large portion of Teodoro Nguema OBIANG's assets have originated from extortion, theft of public funds, or other corrupt conduct," says a Justice Department document dated 4 September 2007. The document relates to a preliminary investigation; as yet no charges have been filed . Kusch employees who spoke with Global Witness' investigator said that Teodorin's yacht will be 118.5 meters (387 feet), housing a cinema, restaurant, bar, swimming pool and a $1.3 million security system complete with floor motion sensors, photoelectric barriers and fingerprint door openers. Teodorin reportedly met a representative of Kusch at a hotel in Switzerland to discuss the design. Its total contract price is approximately £288 million, or $380 million at current exchange rates. This would make it the world's second most expensive yacht, behind Russian oligarch Roman Abramovich’s $1.2billion Eclipse . England's Tim Heywood, one of the world's most renowned yacht designers, produced the drawings for Project Zen. Heywood's previous designs include the 377-foot Pelorus, which served as the blueprint for Project Zen and is also owned by Abramovich. "Kusch's motto is, "we don't just build yachts that you use, we create a dream that you live". But this sounds more like a nightmare for Equatorial Guinea's oppressed and brutalized citizens, whose money may once again be put to Teodorin's benefit rather than theirs," said Hayman. "The yacht company involved should refuse his cash and repudiate any involvement in the project. In addition, this order should raise loud alarm bells for whichever bank handles this transaction." Kusch confirmed to Global Witness that Teodorin was a client, but would not give further details "for reasons of confidentiality". Tim Heywood declined to comment. The Information and Press Bureau of the Government of Equatorial Guinea confirmed that Teodorin had ordered the design, while adding that he "then dismissed the idea of buying it". The spokesperson claimed that if the order had gone ahead Teodorin "would have bought it with income from his private business activities and he would not in any case have bought it with funds derived from sources of illegal financing or corruption". She clarified that in Equatorial Guinea "there are no legal restrictions prohibiting public figures from taking part in private lucrative activities" . Some countries, such as the U.K., require luxury goods dealers including yacht builders to abide by anti-money laundering rules. Like banks, they have to monitor their customers for suspicious activity and report doubts about dirty money to the authorities. Global Witness is calling on Germany to implement similar regulations. In addition, Germany should work with EU member countries to produce mandatory revenue payment disclosure laws for extractive companies, such as those required by the Dodd-Frank Wall Street Finance Reform Act. The Extractive Industries Transparency Initiative (EITI) conference hosted by President Sarkozy in Paris next week would be a good place to start this process. Contact: Robert Palmer on +44 (0)20 7492 5860, +44 (0)7545 645 406, rpalmer@globalwitness.org; or Oliver Courtney on +44 (0)7815 731 889, ocourtney@globalwitness.org. Details on the misappropriation of state money by Teodorin can be found in Global Witness, Undue Diligence: How banks do business with corrupt regimes, March 2009 and Global Witness, The Secret Life of a Shopaholic, November 2009. Budget figures: IMF, Republic of Equatorial Guinea: 2008 Article IV Consultation-Staff Report, March 2009, p. 17. Statement by the Information and Press Bureau of Equatorial Guinea Director, 17 February 2011. The US State Department's most recent Equatorial Guinea human rights assessment was damning, describing unlawful killings, torture of prisoners, official impunity, arbitrary arrest and restrictions on free speech: U.S. State Department, "2009 Country Reports on Human Rights Practices: Equatorial Guinea", 11 March 2010. For more on the oil industry see the website of the Ministry of Mines, Industry and Energy, as well as Human Rights Watch, Well Oiled: Oil and Human Rights in Equatorial Guinea, July 2009. Luisa Kroll, "Fortunes Of Kings, Queens And Dictators," Forbes, 5 May 2006. GDP: CIA, The World Factbook, 2010 estimate. Poverty level: IMF, "Republic of Equatorial Guinea: 2008 Article IV Consultation-Staff Report", March 2009. Mortality rate and access to water: UNDP, "Human Development Report 2009: Equatorial Guinea". US embassy cable 196480 posted on www.elpais.com. Global Witness, The Secret Life of a Shopaholic, November 2009. High street banks up and down Britain became classrooms yesterday as pupils went back to school to learn why Britain's public finances are in such a mess. Class swots took notes as teachers from the New Economics Foundation, Corporate Watch and Tax Justice Network explained how incompetence, greed and worse have wreaked social havoc. Less attentive pupils were disciplined for not paying attention, and Cable, V; Cameron, D.; Clegg, N.; and Osborne, G. were singled out for their poor homework and weak performance in the past school year. More photos of yesterday's events here. Feb 21 - Across the UK this Saturday, UK Uncut will be "Bailing-In" to RBS and Natwest branches across the country, reoccupying bank branches and transforming them into one of the services under threat. Feb 25 - "Despite the return to profit, the bank did not pay corporation tax this year as past losses are still reducing its future tax bill." While, the departing CEO Eric Daniels is to receive a £1.45m bonus. See also video on Tax Research UK, with RBS being taken to task on tax and bonuses. Feb 22 - By Chuck Collins of Wealth for the Common Good "The Tax Justice Network and Business and Investors Against Tax Havens have been pressing over the last year to keep these issues in the public spotlight." And how US UNCUT is now teaming up with other coalitions focused on corporate tax dodging. Feb 24 - Indian Finance Minister Pranab Mukherjee states: "Curbing tax evasion requires close coordination on a multilateral basis. There is a need to develop an effective multilateral platform for automatic, spontaneous and requested exchange of information." See TJN On Exchange of Information for Tax Purposes. Feb 24 - Nicholas Shaxson on the "institution with a murky history and remarkable powers that acts like a political and financial island within our island nation state" - the Square Mile and the City of London Corporation. See also Nick's blog Treasure Islands. Feb 22 - Concerns are expressed that continued monitoring of tax evaders could require greater resources in HM Revenue & Customs. A challenge that exists in many jurisdictions, that needs to be addressed - sufficient numbers of personnel are required, fully trained in detecting and analysing layers of secrecy. Feb 9 - We haven't yet reviewed this paper, but it may be of interest to those trying to understand the taxation of hedge funds. See also article by Marty Sullivan and Lee Sheppard of Tax Analysts Offshore Explorations: Caribbean Hedge Funds Part 1 Tax.com and Part 2 here at Tax Analysts : "Previously we reported that tax evasion by individual investors in offshore hedge funds was a relatively easy undertaking." Feb 12 - An interview with our friend Eva Joly, on how tax evasion in Africa exceed the amount of development aid, and how those in power make decisions based on their own enrichment rather than the welfare of their populations. See also here. Feb 23 - More on commentary on a case we've been linking to in past days. Note: "In the fall of 2008, Credit Suisse began exiting the U.S. cross-border banking business, and the bankers advised clients to transfer their accounts to other Swiss banks that did not operate internationally and were therefore not subject to anything but Swiss law." Rock on Jello - action on combatting abuse of tax havenry is needed at the global as well as at national level. 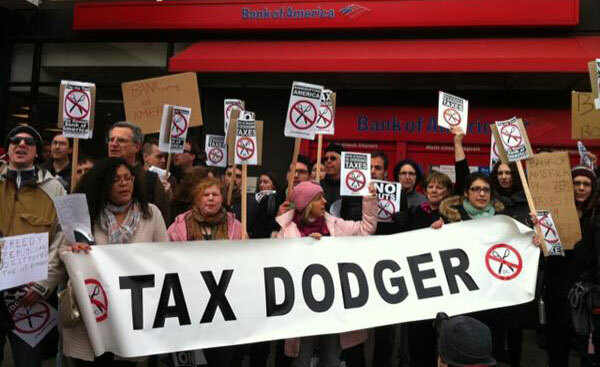 Groups of citizens in more than 50 cities will sit-in and protest at Bank of America branches on Saturday, February 26 in an effort to get corporate tax dodgers to pay their fair share. The actions are loosely affiliated with US Uncut, a new grassroots movement organized through social media networks such as Twitter and Facebook. Anger is rising as Americans are being forced to endure brutal budget cuts at both the federal and state-level. Recent events in Wisconsin represent the need for hard-working Americans to make their voices heard and demand an end to unfair measures. US Uncut instead calls for an end to corporate tax avoidance. "The $3 in my wallet is more than ExxonMobil, GE and Bank of America paid in taxes last year, combined," said Carl Gibson, founder of US Uncut Mississippi. "There's a direct connection between corporate tax dodging and what's happening to real people’s lives. Because of overseas tax havens and other tax loopholes, US corporations are making profits in America but barely paying taxes here. If we close those loopholes, we wouldn't have to be cutting back on firefighters, library hours and student loans." Gibson, a 23-year-old resident of Jackson, Miss., was moved to start his chapter two weeks ago after learning about corporate America's unpaid tax bills and how a similar movement, UK Uncut, has swept across England and successfully brought tax dodgers to justice through sit-ins at stores and bank branches. "I work 3 jobs and can barely cover my $450 per-month rent," Gibson said. "But I still pay my taxes. All I'm asking is that the wealthiest corporations pay what they owe, too." "These cuts are unnecessary. The money is there." said Joanne Gifford a self-described soccer mom from Napa Valley, Calif. who will be paying a visit to her local Bank of America branch on Saturday. "We The People just have to make sure that these tax-dodging corporations pay up." You can watch Glenn Beck frothing at all this, with all the usual misinformation, here. Feb 24 - UK Uncut actions will hit RBS branches across the country this coming weekend. A protestor speaks out on how women will bear the brunt of cuts - "I am in the process of organising a UK Uncut action ... against the unnecessary austerity cuts that will push women's rights back a generation." Lives may be lost as a result of cuts. See also RBS bankers get £950m in bonuses despite £1.1bn loss The Guardian Feb 24 - Bailed-out bank increases part of revenue paid to bankers. --- And RBS had £25billion stashed in offshore havens depriving taxman of up to £500million Daily Mail Mar 13, 2009. Feb 24 - Hat tip Scott Klinger of Wealth for the Common Good. Scott observes: "Doesn't this make the connection that the tax haven network, the superhighway of capital, is central to the greedy pay of bankers? We want to control CEO pay and promote social equality, we have to deal with tax havens. It also seemed interesting that the argument in the article points to how much taxes are paid. I wonder how much is evaded as their vapor trail of money circles the globe." Feb 24 - Switzerland announces freezing any assets belonging to Libyan leader Gaddafi and his entourage. Feb 24 - Nick Shaxson observes how the big money is widely dispersed throughout the membership of power structures and elites - especially in the upper echelons. Feb 23 - Anthea Lawson of Global Witness writes on truth and reality of laundering proceeds of grand scale corruption, and warns that the Financial Action Task Force (FATF) wants to remove officials’ “family members and associates” from the list of those on whom banks must perform extra checks. As a side note - it is interesting that a Barclays Wealth sponsored ad appears next to the online FT article. Barclays is exposed by Global Witness as having laundered proceeds of kleptocrats from Equatorial Guinea and Nigeria - see Undue Diligence: How Banks Do Business with Corrupt Regimes and International Thief Thief: How British Banks are Complicit in Nigerian Corruption. Feb 19 - "Shouldn't governments committed to promoting democracy and transparency try to identify and freeze dictators' dirty money while they are still in power, when it might change their behavior? Or are asset seizures merely a departure tax that fallen autocrats pay as they run out the door?" Hat tip Nicole Tichon. Feb 24 - In Islamabad: 'For every Rs100 collected by the Federal Board of Revenue in taxes, it misses another Rs79 due to tax evasion', said Salman Siddiqui, chairman of the FBR, while testifying before the Senate Committee on Finance and Revenue on Wednesday. A crackdown is expected. Hat tip Offshore Watch. Feb 23 - Credit Suisse is coming under heightened scrutiny of authorities in the United States and Germany over its sale of private banking services that enable tax evasion. The indictment said that the four bankers also worked with three other banks to conceal the assets of wealthy Americans. Feb 24 - Standing up to Germany and France over a corporate tax rate they say is vital to reviving the country’s battered economy, Ireland's politicians continue to try to stiff the regular EU taxpayer. However, as Angela Merkel observed: "The corporate tax rate led to 'misallocations' that helped cause the Irish banking crisis. While EU countries should set their own rates, they should be limited to a certain range', she told an audience in Freiburg, Germany, yesterday after an economic-policy speech." Feb 11 - A flyer - on tax havens being responsible for poverty. See also earlier TJN blogs here and here. Canada Uncut - on Twitter, with a lot of associated links, and a website. Netherlands Uncut - on Twitter, so far. Q. It is estimated that $500 billion of Indian taxpayers' money is stashed in tax havens abroad. Is it desirable and feasible to bring this money back? Joseph Stiglitz: In the case of India the problem is very severe. The G-20 has recognised that these tax havens are really bad for the global economy. Advanced industrial countries were focusing on the adverse effects tax havens have on their tax collection, but for emerging markets like India the problems are even worse. Because, typically, they need money for tax revenues even more and the tax havens are also often corruption havens, money that is touched in a way or another by illegality. It seems to me that there should be concerted pressure to close them down. They serve no socially useful function. They exist only to circumvent norms. They undermine good governance. Not sure of the date on this interview, but it seems to be current. Feb 23 - Nick Shaxson on Taxwash and on the beauty of UK Uncut protest. Feb 23 - Proposed reforms are likely to mean multinational companies pay no or little corporate tax in the UK. See also EU Targets UK Anti-Avoidance Laws Tax-News.com - "David Kilshaw, of KPMG, said the ruling conjured, 'a vision of a tidal wave of money moving offshore' if the Revenue were forced to draw the teeth of its anti-avoidance legislation. This announcement shakes the very foundtions of the UK tax system, he said." Also New UK tax rules could cost poor counties billions - by our friends at ActionAid . Feb 21 - The Guardian joins calls for country-by-country reporting, observing the joke: "Our desire is to make this report as transparent and open as possible," says Barclays chairman, Marcus Agius, in his online introduction to his bank's 2009 annual report. 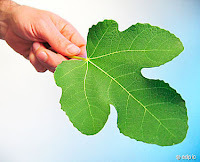 Feb 22 - Is this real, or another fig leaf? Is there a media fuss on easy targets while the biggest perpetrators continue with impunity? Note also comments by Richard Murphy. Feb 22 - Registering protest at the fact that only big businesses are being consulted on major Corporate Tax reforms. See also Richard Murphy. Feb 23 - Nick Shaxson comments, within the category "Criticism by those who think offshore abuse is too difficult to tackle so we should just give up". From Mark Herkenrath of Alliance Sud, in Switzerland. He's clearly speaking from the heart - and rightly so. On their website, you'll find that the site is located "in the UNESCO protected vineyards of the Lavaux". 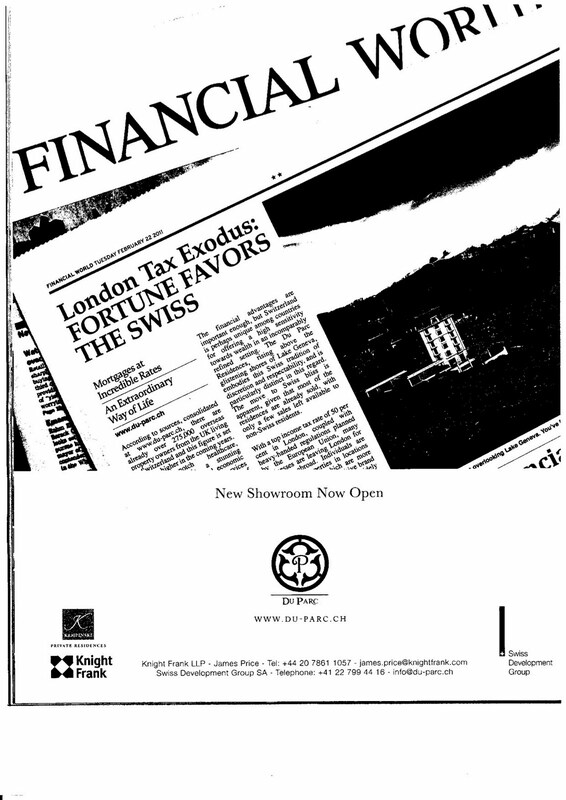 It is managed by Kempinski-Private Residences, who "along side Swiss Development Group and Banque Piguet & Cie SA will offer buyers tailor-made advice for relocation, tax advice and wealth management". How convenient! Other partners of this tax brothel project include the Montreux Jazz Festival (ouch!) and Bank Sarasin, which states on its website that it "is keen to actively meet its responsibility towards society and has set itself objectives for relationships with social partners"
Bank Sarasin, by the way, has just launched a new trust company in Singapore, which will provide "discretionary trusts (providing trusteeships for full protection trusts, tailor-made, holding liquid and non-liquid assets) and insurance trusts (holding life insurance policies only), as well ascorporate services, providing the management of offshore companies". The property millionairess Leona Helmsley famously said "We don’t pay taxes. The little people do." 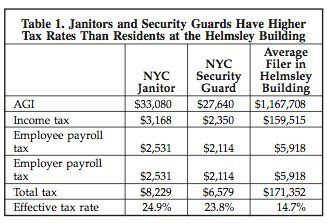 Well, Marty Sullivan of TaxAnalysts has just done an analysis of the inhabitants of the Helmsley building in New York, straddling Park Avenue between 45th and 46th streets. Who in the building pays the most? The graphic speaks for itself. From Mother Jones: these pictures say a lot. European countries share tax-related information with each other as a matter of course, under its Savings Tax Directive, which for all its faults does go some way towards helping countries tax their citizens appropriately. A few laggards - Austria and Luxembourg are a case in point inside Europe - have insisted instead on merely subtracting witholding taxes from income earned inside their jurisdiction, but refuse to supply information (and to add insult to injury, they take a cut of the proceeds too). There are many reasons why information exchange is far superior to witholding taxes - not least because tax evasion isn't the only reason why people hide money. Insider trading, people trafficking, market manipulation, and so on - one can think up endless reasons why people want secrecy. The EU has issued a consultation document that identifies a further, more subtle reason for preferring transparency, to add to the long list of reasons. "It could favour high income earners in that the ability to pay potential of taxpayers would not be taken into account." In other words, tax authorities will put a high income earner in a lower tax bracket, because they won't know how high their income is - and therefore apply a lower tax rate to them. And of course it could lead to other forms of tax planning. Just a thought to add to the mix. And there's more on this here. Feb 15 - Nicole Tichon of Tax Justice Network USA blogs on the impact of President Obama's budget released this week, the deception of big-corporate and their tax dodging, on protest, and on work to be done. Feb 18 - The Swiss are helping decision-makers from South Sudan - which has just voted to split from the north - to build up a central bank. Representatives of the soon to be sovereign country and Swiss specialists have met in Zurich for a three-day workshop. We wonder just how the members of that particular forum were decided upon. Feb 17 - Criticism of the ‘aid industry’. Though tax is not mentioned specifically here, accountability by government to citizens is an important thread. Tax justice, mobilisation of domestic resources, provides for this route. Feb 14 - A Mubarak-owned property with ownership trail vanishing into secrecy layering via a Panamian company. And a fig-leaf Tax Information Exchange Agreement with the U.S.
Feb 17 - Anti-corruption campaigners pressed Egypt's chief prosecutor Thursday for an investigation into the assets of Hosni Mubarak and his family. At the center of the activists' complaint are records that raise questions about offshore companies and funds based or registered in Cyprus, the Bahamas, the British Virgin Islands and the Cayman Islands. Feb 15 - Crucial insights - an interview with Nicholas Shaxson, author of Treasure Islands. Feb 18 - Facing flak at home over black money stashed abroad, India will press for transparency in the functioning of tax havens at the G20 Finance Ministers meeting in Paris on Friday to unearth "ill-gotten" money lying in such sovereign jurisdictions. Feb 16 - "The Czech government Wednesday approved draft agreements about exchange of information with tax havens on the islands of Guernsey and the Isle of Man. Prime Minister Petr Necas (Civic Democrats, ODS) said at a press conference after the government meeting Wednesday. The agreements will enable the Czech Republic to check whether Czech companies duly tax their incomes and assets in tax havens, Necas said." Hardly. Beware the fig-leaf. This is what is needed. Dec 7 - Observing this report on how the U.S. continues to lag behind other developed countries, possibly the U.S. might think of education spending as an alternative to tax cuts for the rich. Feb 18 - Anti-tax avoidance organisation aims to bring 30 Barclays branches to a standstill while US Uncut plans own demonstrations. Feb 18 - Corporate hypocrisy in its prime. Including: "Offshore Law Firm of the Year". Yes, too awfully true. The abuse happening not only in pain sight, but opulently celebrated. Feb 17 - The UK's Revenue & Customs’ main weapon for stopping offshore tax avoidance is under attack from Brussels, which says rules that stop investors moving their wealth abroad impinge on fundamental principles of the single market. (1) In accordance with resolution 2004/69 of November 11, 2004 which determined that the UN Tax Committee should “give special attention to developing countries and countries with economies in transition,” the method of choosing members of the UN Tax Committee should be revised so that more experts from developing countries and countries with economies in transitions be appointed to the UN Tax Committee. Developing countries and countries with economies in transition are not at present adequately represented on the UN Tax Committee. (2) The UN Tax Committee should be “upgraded” to an intergovernmental commission and given more budgetary resources in order to carry out its important functions. (3) International tax cooperation has become even more important, especially for developing countries, and it is essential that UN Tax Committee, the most appropriate forum for the consideration by the international community of these issues, continue to focus on, and try to resolve, these major international tax issues. Global Financial Integrity, a research institute, has recently issued a report, “Illicit Financial Flows from Developing Countries: 2000-2009,” which concludes that approximately U.S. $6.5 trillion was removed from developing countries during that period as a result of crime, corruption and trade mispricing. Substantially all of such illicit financial flows from developing countries end up in financial centers in the developed countries or in offshore financial secrecy/tax haven jurisdictions. Such illicit financial flows, which are encouraged and facilitated by financial institutions and other intermediaries in developed countries and offshore financial secrecy/tax haven jurisdictions, are far in excess of the approximate US$105 billion in Official Development Assistance (ODA) that developed countries provide annually to developing countries. Automatic exchange of the information can be an effective measure against such illicit financial flows. The [Stiglitz] Commission of Experts of the President of the General Assembly on Reforms of the International Monetary and Financial System has called for automatic exchange of tax information. Agustin Carstens, Governor of the Central Bank of Mexico, formerly Secretary of Finance of Mexico and Deputy Managing Director of the International Monetary Fund, has stated: “The automatic exchange of information on interest paid by banks will certainly provide us with a powerful tool to detect, prevent and combat tax evasion, money laundering, terrorist financing, drug trafficking and organized crime.” And the United States has recently enacted the Foreign Account Tax Compliance Act (FATCA), requiring in effect automatic exchange of information. These significant developments reinforce the need for the proposed UN Code of Conduct on Cooperation in Combating International Tax Evasion, and for continued debate and analysis by the international community of these tax related issues. The UN Tax Committee, by promoting international tax cooperation and effectively bringing into the process developing countries and countries with economies in transition, can be and should be the most appropriate and most effective international forum to confront, and try to resolve, these and other major international tax related problems. Reporter: You don't subscribe to the Laffer Curve? Sachs: You better believe, I don't, because history has shown what nonsense it is. For more on the Laffer Curve, see here. We have just been sent, a new paper entitled A new tax technology: The Brazilian experience with a general bank transactions tax. "The special interests in Brazil finally got rid of their Transaction Tax because -- are you ready -- it was so dependable and automated, they could not cheat and evade like with VAT and income tax." Indeed. This is an important element of transactions taxes, and the paper looks to be worth reading for those following the debates. Comments welcome. Or at least it looks like it - we don't have any good information yet as to who the organisers are. But this looks promising. And their first action follows Johann Hari's excellent article in The Nation, and this earlier piece of ours. Already on twitter there are US Uncut groups springing up - @nycuncut, @brooklynuncut, etc. Let's hope it grows real legs. Via the fast-growing TJN-USA, we hope to do everything to help. The thing to note about it, apart from the positive reception in the comments, is that it was both 'Rescued' and featured on the 'Recommended list'. The first of these means that it was selected ('rescued') as a good post and linked to on the front page, to give it greater attention. The second means that it was very popular among users of the site. Daily Kos has a system whereby if you like an article you 'recommend' it by pressing a button. The articles that receive the most recommends are then featured on the front page in the 'Recommended' list, as this one was. What this shows is that the Daily Kos audience - the activist left-liberal wing of the Democratic base - is very interested in the arguments you're making. Which suggests to me that, again, this campaign has some serious legs. There clearly is an appetite in the US for this stuff. Now, we hope, citizens can start to get organised. There really is a progressive alternative to the Tea Party here.